I have confirmation from UPS that the parcel has been delivered. 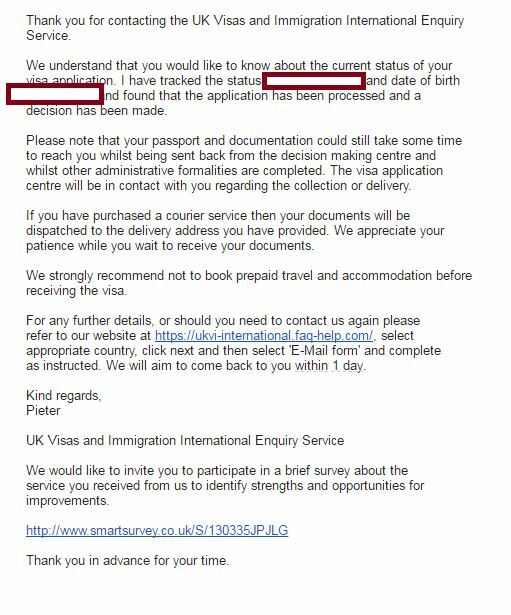 My friend has received a confirmation mail from the embassy that his visa application is in process, its been 3 days and I still haven't received an update on my application via email. Is this something that could be a mail room error or is it that when applications are sent together updates are only provided on one GWF number. Also, we put only one return courier label inside the envelope, will that suffice? Any advice, clarifications at this point is much appreciated since I am getting a little nervous. Please use the link below to get an update on your application. They reply within one business day and also give you an update on your application. I was also getting a bit nervous because I did not get any update from the Embassy even after 15 days so I decided to mail them and received a response from them the very next day. Goto the link below and select your country. Then select option email us and provide your application number and your concern. I have also attached a snapshot of the response that I received from the UK embassy. Not the answer you're looking for? Browse other questions tagged visas uk indian-citizens paperwork application-status or ask your own question.